My cousins are educators and parents of two precious little girls. I understand how important it is to lead our youth to a growth mindset so I made this fleece lined hoodie with pockets for their first born. This wording is 9″x9″ and best suited for 4T-6T based on the size of the image. Fully lined crochet beanie with faux fur pom-pom and snud (later not lined). This set takes approximately 10 days to complete. You must email me directly to communicate your color preference, my availability and start date. Start time varies depends on pre-payment and current orders in progress. Note: Due to popular demand, orders received after 1/26 will not begin until 2/23. After making a friend a lined hat and snud for Christmas, several orders came in and it’s kept me busy. What better way to combine my love for sewing and crochet. To order, look at each style name below and click on “Store” in the menu bar. I few weeks ago, I posted a preview of my crochet project that looked like a mass of loops. Last night I finished and below explains the loops. Being asthmatic and suffering COPD, winter months can be extremely hard on me but I do not like how a long scarf adds bulk under my coat. I made myself a braided cowl (yes with fringe) instead of a long scarf that will cover my neck AND a matching slouchie beanie. I went to a well known local furniture store yesterday in search of microfiber sofa pillows. I selected the fabric and the salesperson said they were $75. I left. I could not justify $300 for $30 worth of fabric. Later, I stopped by a fabric store’s upholstery department in search of a camel or tan color. Lucky for me the microfiber fabric was on sale for $19 a yard and they had what I needed. Two yards and four zippers later I have four new 18″ pillows for the sofa and chaise. A little after the Christmas holidays, I began crocheting skull caps for various charities affiliated with my employer as well as local hospitals. I also crochet baby clothes and blankets. Lately, my yarn stash has become ridiculous, therefore I’m at a point that I had to catalog my yarn in an iOS app to know exactly what I currently own. This ensures that when I am in a yarn shop, I am not unnecessarily buying yarn that I already own. Once I reached 103 skeins and hanks I felt that its best to buy a shelf. The problem is, I was against investing in a Sauder shelf because they are compressed wood and I found Raymour & Flanagan too pricey if it’s just a yarn shelf. Then I thought, “Wait a minute! I can do this! Using a little ingenuity and an Xmas gift card from my daughter, I decided to make my own shelf to store my yarn and the flat screen in my sewing room. I take pride in this because I did this without anyone’s support. Even though I knew that my yarn would not weight much, I was unsure if the crates would provide stability, so I decided to go to Home Depot and buy wood to support the back and base (I used birch – no specific reason other than color was close to the crates). .
After work, and any time that I wasn’t watching Netflix, I began sanding. This was necessary to ensure that the wood does not snag the yarn. I read that stain applies better if you apply wood conditioner so after sanding, I applied a coat of wood conditioner and allowed 30-45 minutes for it to absorb. As I began toying around with the assembly of the crates, I got the idea to add feet. Ugh! Here I go back to Lowes on Memorial Day weekend. When I arrived, I honestly did not know how I was going to affix them or Lowe’s selection. I was overwhelmed and stared at various legs and bums for 30-45 minutes. I selected on a 4″ to raise the shelf off of the ground. Because my shelf is going to be roughly 70″ wide, I felt support in the middle would be best, so I invested in 8. Just look at the rich color! I was so pleased in this stain choice.i knew this would definitely pop once I painted the crates white. The first really looked good. So I gave it a few days to completely dry, did a light sanding and added a second coat. I then waited a few days to ensure that there were no sticky areas before assembling. On Father’s Day 2018, I had the privilege of finally getting around to emptying some of the bags and boxes of yarn. I wiped down the shelf, brought it upstairs to my sewing room, stocked it, and stood back to stare at my work and smiled. I would have made my late mother proud! I blinged our the straps with gold ribbon. When MimiG discussed the release of Simplicity pattern 1019, I knew that I wanted to sew this. Like a Prince fan camped outside of the local Ticketmaster box office, I was READY on the release date. 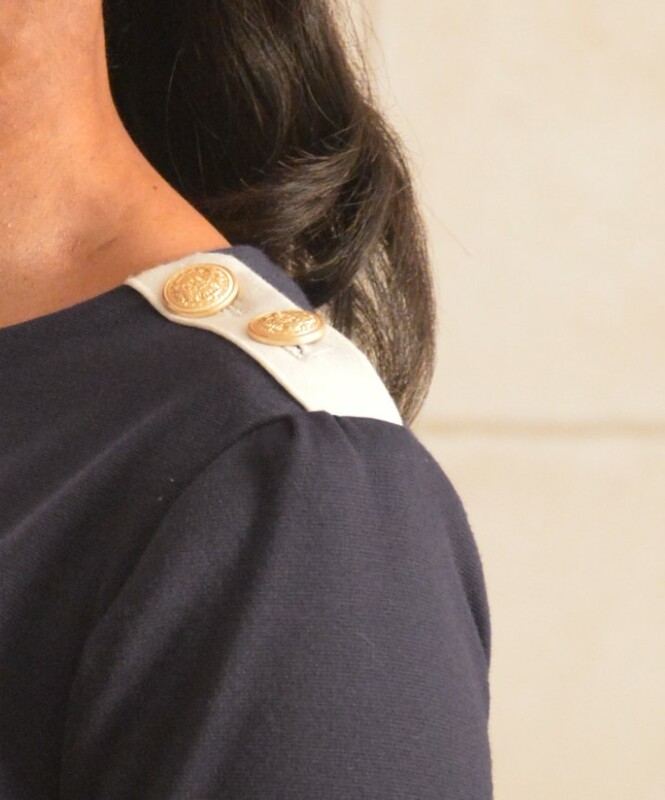 I fell in love with the style and wanted an opportunity to successfully sew a Simplicity pattern in a day, especially something that I could wear to work or a night out with my girlfriends. 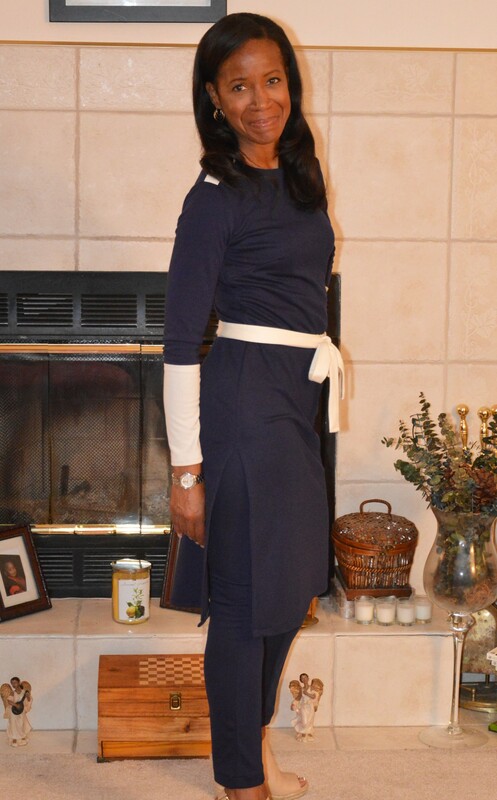 The belt, the buttoned shoulders and the slits on the side….SMH. I had to have it! Modifications: None. I wanted to make this precisely as written. Would I make it again? : Most definitely! I knew when I purchased the pattern that I wanted two sets. One long, pictured here in navy and white knit and one all off-white with a shorter pullover which I plan to sew this weekend. In the winter, I love off-white knits. The only difference, the next go round is make the leggings a size 8. I am a normally a size 4/6 and cut my leggings in a size 6. They fit perfectly unlike any leggings that I have purchased. I washed them after sewing and they did not shrink in length or around the hips but I would like to know that I can pig out and not have to worry about the waist after a hearty meal. Difficulty: Zero difficulty. 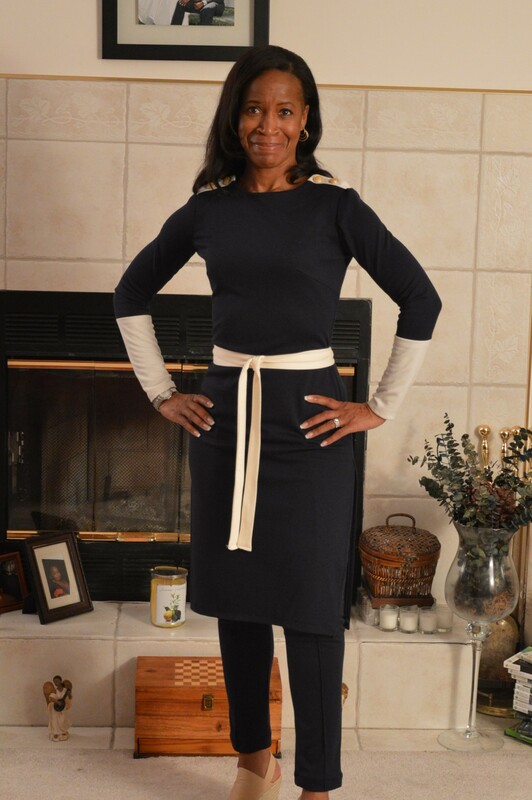 This pattern was very easy to follow and took three hours from cutting to hemming.